A heartfelt apology to Cubs fans. A few posts ago, I expressed the hope (having lost faith in this year's model of my beloved Mets) that this might be the year you would be able to celebrate your team's first World Series championship in a century. I should have realized that, by publishing this, I was jinxing, even cursing your team's fate. My name should begin with "B", because I'm as bad as any billy goat, or black cat, or Bartman (now here's a team that's been beset by killer "B's"). Update: OK, things looked better today. But remember, the Mets are 2-0 against the Yanks so far this year, and, aside from hometown bragging rights, it's done them no good. Edna G was the last steam powered tug in use on the Great Lakes. She was retired from service some twenty years ago, but remains tied to this pier near an ore dock somewhere on the shore of Lake Superior. She appears well cared for in this photo taken just a few weeks ago--perhaps some historical society has made her its charge. Thanks to TenaciousK for taking the photo and posting it on Tenacity Central. Hi Claude! 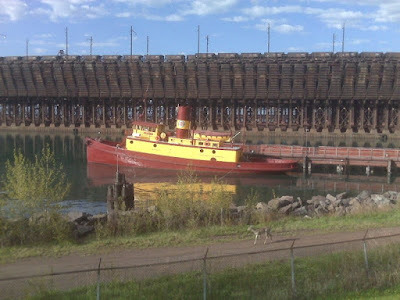 She's moored to a working pier at Two Harbors, a town about 30 miles north of Duluth. According to the placard, she is kept in working condition, and was completely restored in 1994. I figure with diesel prices being what they are, perhaps someone is thinking her retirement will not be, er, permanent. He also gives a link to this Wikipedia article about her, which says she's listed in the National Register of Historic Places, and has a footnote indicating she's under the care of the Lake County (Minnesota) Historical Society. 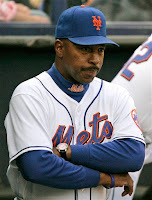 Probably the last commentary on the firing of Willie Randolph. I went to Google Images to find the perfect Willie photo for this post and, in wonderful serendipity, found it on a most unusual and fascinating sports blog called A Pudge is a Sandwich, from which I filched the image at left. What's fascinating about APIAS is the odd aggregation of teams it covers: "Vols [Tennessee], Cats [Kentucky, not Northwestern or Vermont], Wolverines [Michigan], Cubs, Tigers, A's, 49ers, Bengals, Bears and Mets" (note that the Mets get separated from the rest of the MLB by three NFL teams--does this indicate they were an afterthought?). Perhaps the only thing I can guess from this odd assemblage of rooting interests (as well as their penchant for finding flimsy reasons to include photos of scantily clad, amply bosomed women in their posts) is that the people who put out APIAS are all feisty Appalachian Scotch-Irish lads with a taste for (with the exceptions of Tennessee in football and women's basketball, Kentucky in men's basketball, and Michigan in anything) underdogs. Anyway, I have little more cogent to say about what will surely go down in Mets history as the Midnight (PDT) Massacre than has been said by Smoothron in APIAS. All I have to add is that I mourn the loss of Willie, inevitable though it had become, because he was a genuine local hero, the first for the Mets since John Franco. He grew up in my beloved, adopted Brooklyn rooting for (as any Brooklyn kid should) the Mets, and can be forgiven for having spent most of his professional career with the hated Yanks. Them's the breaks. Goodbye, Willie. May you find a new gig, one that will bring you success, soon. Nothing like a top-of-the-10th HR to get Jerry his first win!! The Mets have impressed me lately with their ability to come back in extra innings, and I'd like to see Manuel have a successful run as interim (maybe permanent, if he's interested) manager. I still don't see a miracle comeback from their miserable start, and will be happy if the Cubbies take the Series this year. Of course, I'm always open to being surprised.